OKLAHOMA CITY (Sept. 18, 2017) – The Oklahoma State Department of Education (OSDE) has submitted its comprehensive plan for public education to the U.S. Department of Education (USDE) for review and approval. The plan outlines OSDE’s 8-Year Strategic Plan to provide Oklahoma students with a competitive edge. As part of the federal Every Student Succeeds Act (ESSA), all state education agencies must submit a plan regarding their use of federal education dollars. Under ESSA, the federal prescriptiveness of No Child Left Behind has been reduced to allow greater flexibility and innovation on the part of state and local education agencies. State Superintendent of Public Instruction Joy Hofmeister said the OSDE sought to develop a meaningful state plan that ensures Oklahoma students and schools reach higher outcomes. Woven throughout the 218-page state plan is an emphasis on the importance of serving individual learners and a steadfast belief that every child, teacher, and school can succeed. To that end, OSDE’s 8-Year Strategic Plan, titled Oklahoma Edge, is built on a foundation of four pillars (each underpinned by actionable strategies), six measurable goals and an equal number of initiatives to meet specific Oklahoma student needs and drive progress. Score among the top 20 highest-performing states on the National Assessment of Education Progress (NAEP) – otherwise known as “the nation’s report card” – in all subjects for fourth grade and eighth grade. Reduce by 50% the need for mathematics and English language arts remediation after high school. Rank among the top 10 states with the highest graduation rate for students in four-, five- and six-year cohorts. Ensure that 100% of students in grades 6 through 12 develop a useful and meaningful Individualized Career Academic Plan (ICAP). Align early childhood education and learning foundations to ensure at least 75% of students are “ready to read” upon kindergarten entry. Increase student access to effective teachers, thereby reducing the need for emergency-certified teachers by 95%. Increase access to child nutrition by removing barriers to participation in food programs. Leverage out-of-school time to address students’ needs and to engage family and community. Increase identification of gifted and talented minority students. Engage in collaborative identification and supports for students of incarcerated parents. Utilize a risk analysis, applying preventive measures for teachers who may become ineffective. Promote a well-rounded education by establishing Programs of Distinction whereby schools are recognized for high-quality curricular and extra-curricular programs. Over more than a year and through multiple working drafts, OSDE has solicited feedback from a diverse cross-section of education stakeholders statewide. 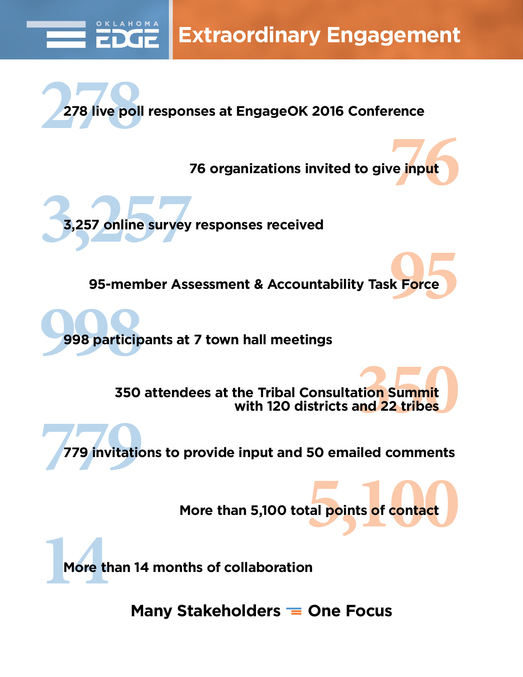 The plan submitted today reflects 14 months of collaboration with more than 5,000 individual points of contact, including educators, parents, elected officials, business representatives, tribal partners, the faith-based community and nonprofits.